I don't know if anyone actually looks at it ever, but there is a photo of me and the kids in the right hand corner of this blog. 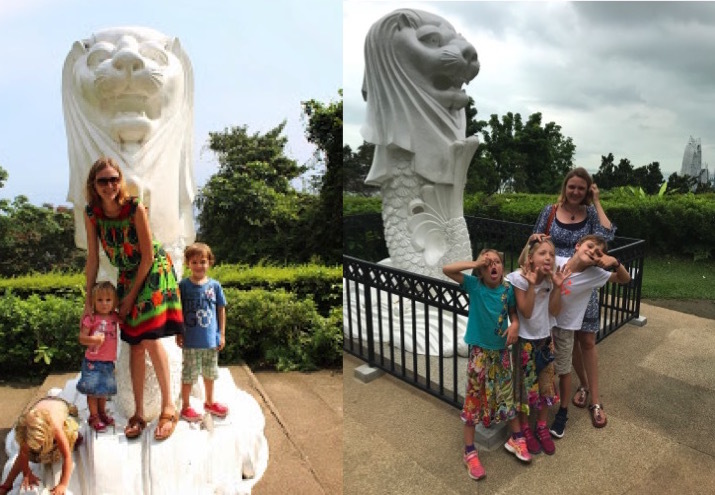 We are all balancing on that most iconic of the Lion City symbols: the Merlion. Perhaps it is time to change this photo, as it has become a bit dated. Not only is it about five years old, but the kids seem all wrong too. Tijm is standing still and smiles. Singapore's-next-top-model Linde, who usually strikes her most charming poses and smiles when a camera is in sight, is upside down; you can't even see her face. Baby Jasmijn is so little I need to hold her tight, and I can't remember whether this is because she was not yet that stable on her feet, or if then - like now - she always tried to escape and avoid being in any photo at all. Needless to say I still look exactly the same as I did five years ago - twenty eight forever. When I first started blogging I mostly wrote about my children. Parenting; the sweet and the sour. When they are small, your offspring can consume your everyday thoughts. When we moved to Asia, the move and the wonders of the region began dominating my writing. Now, it has become a random place to share random thoughts, erratically and irregularly. Does a blog like this even need a photo, particularly one including my kids? Since we were on Mount Faber a few weeks ago anyway, we thought we'd reenact the old scene. To my surprise a fence had been put up around the Merlion! That is progress in Singapore for you. Can you spot the differences? Which one is better? I am not sure what kind of bribery or threaths were involved with making the picture below (most likely ice cream and/or the withdrawal of pocket money) but this one is not my favourite. No one is doing any bunny ears or photobombs in the back. That is just not realistic! Just after this was made the heavens broke, and the umbrella that Linde is holding proved completely futile to protect us from the cats and dogs dropping from the sky. That too is Singapore. Getting close to six years in, we still love it here. Rain or shine, old and new. Oh, en ik volg je al lang!